March 20, 2017, 10:20 a.m.
Have a WhatsApp chain message you want factchecked? La Silla Vacía’s WhatsApp Detector first wants you to commit to spreading the factcheck to your friends. 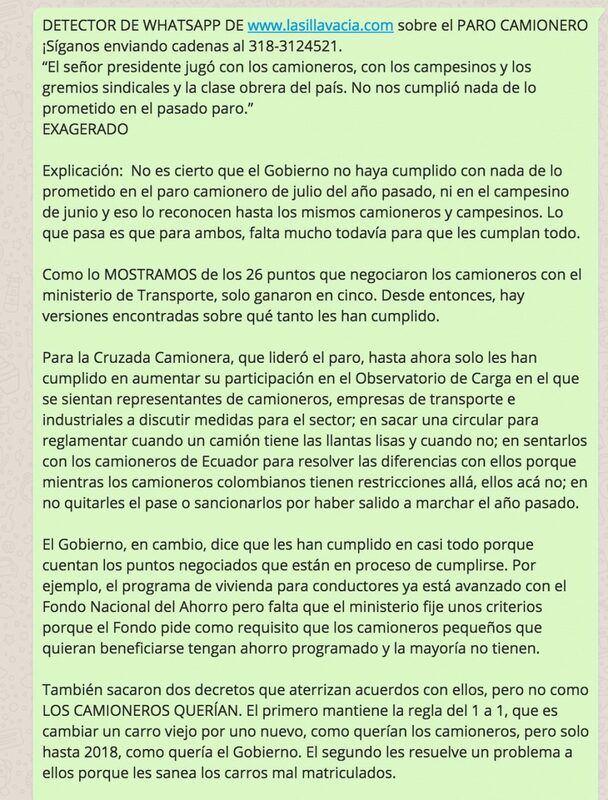 By Carlos Serrano March 20, 2017, 10:20 a.m. In 2016, Colombian journalists faced the challenge of telling one of the most important stories in the country’s history: after more than 50 years, the Colombian government and the FARC reached a peace agreement to end the decades-long conflict that had left more than eight million victims. It was a critical moment for news organizations, which had to find ways to explain clearly a process tangled with political interests that would determine the future of millions of people who were calling for truth, justice, and reparations. News media, however, had another challenge: to keep up with various conversations circulating on social media, especially via WhatsApp, where all kinds of viral stories about the negotiations had spread. 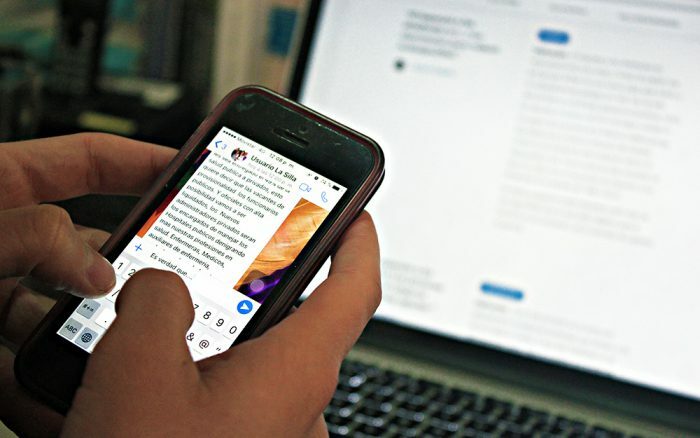 Users shared chain messages (“cadenas”) without an understanding of whether the news they shared was accurate — a critical issue, since those messages could’ve swayed votes in the country’s referendum on a peace deal between the government and FARC rebels last fall. So La Silla Vacía launched WhatsApp Detector, a service that factchecks viral chain messages that circulate on the platform. Around 60 percent of Colombians regularly use WhatsApp, according to a survey by the country’s Ministry of Information Technologies and Communications (Ministerio de Tecnologías de la Información y las Comunicaciones), second among social platforms only to Facebook (which is WhatsApp’s owner, of course). It’s difficult to get a precise count of viral messages circulating on the platform, but chatting and sharing through WhatsApp is a regular part of the lives of many Colombians, who circulate information among friends, co-workers, and family. Every day, chain messages spread that speculate on the intimate lives of celebrities, recommend magical or miraculous rites, announce impending catastrophes or epidemics, or pose as official communications from authorities. Something these messages all have in common: They include an urgent request that you share the message with your contacts, or else something bad will happen to you (see: those chain emails of the ’90s/early 2000s). Since January 30, La Silla Vacía has run a WhatsApp account to which anyone can send a chain message they’ve received that they want factchecked. La Silla Vacía receives around 15 of these chains each week. The WhatsApp service is an extension of Lie Detector (Detector de Mentiras), which La Silla Vacía has run for several years on its site to factcheck claims made by powerful figures in Colombia. Every day, usually in the evening, Juanita Vélez — the La Silla Vacía reporter who came up with the idea for the WhatsApp Detector — reads the submissions and decides which to factcheck. Users submitting a chain for factchecking are required to send a screenshot of it, to confirm that that message is something that’s actually circulating within the WhatsApp network. The La Silla Vacía team chooses the messages they’ll factcheck based on these criteria, as well as on the political relevance of their contents (the aim is to check at least one story a week). They first select the sections of the message that are actually checkable; that is, claims that can actually be compared against other sources of information. The rest is standard journalistic practice: reviewing data, consulting documents, contacting sources who can help verify certain pieces. Once the factcheck is complete, then comes a critical next step: La Silla Vacía sends it to the reader who requested it, who is then asked to send a screenshot showing that they’ve forwarded the checked message to their contacts — treating the “virus” with the same tool used to propagate it. La Silla Vacía prides itself on a very responsive community of readers, and requesting this commitment from its readers is in line with the site’s broader efforts to elevate the level of public discourse in Colombia. La Silla Vacía also posts the factchecking stories to its site. It’s published stories around the FARC’s demobilization sites, taxes in the Colombian city of Cúcuta, the Colombian senator Claudia López of the Alianza Verde party, a truck drivers’ strike, and the rumored passing of a “Roy Barreras” law. The chain message about an alleged planned strike, for instance, was an example of how claims started circulating among WhatsApp users before the media was able to deal with them, so for La Silla Vacía, the work has also been a way to draw their attention to trends and issues before any events happen. According to León, 90 percent of what they’ve factchecked turns out to be untrue, which suggests that people share information on WhatsApp based on their emotions and interests, not what they know to be factual. For now, the WhatsApp Detector only focuses on these chain messages, but the team is starting to look into chain videos, and is evaluating whether it might apply similar procedures to information sent around as audio messages or memes, two other popular formats for sharing on WhatsApp. As the WhatsApp Detector experiment is still relatively new, it’s too early to call out specific trends or repeating patterns that might help determine who creates these chains or how these chains move around. So far, La Silla Vacía has seen a sense of paranoia around power and authorities. But beyond that, in a few months, the team hopes to begin identifying characteristics that will help them determine who’s behind these message chains and figure out how and why they’re started. Still, with the rise of fake news, there’s the unfortunate reality that even when an organization makes an effort to verify information, often the damage has already been done, the doubt already sown. Photo of the WhatsApp Detector in action via La Silla Vacía. POSTED March 20, 2017, 10:20 a.m.
Serrano, Carlos. "To slow the spread of false stories on WhatsApp, this Colombian news site is enlisting its own readers." Nieman Journalism Lab. Nieman Foundation for Journalism at Harvard, 20 Mar. 2017. Web. 20 Apr. 2019. Serrano, Carlos. "To slow the spread of false stories on WhatsApp, this Colombian news site is enlisting its own readers." Nieman Journalism Lab. Last modified March 20, 2017. Accessed April 20, 2019. https://www.niemanlab.org/2017/03/to-slow-the-spread-of-false-stories-on-whatsapp-this-colombian-news-site-is-enlisting-its-own-readers/.